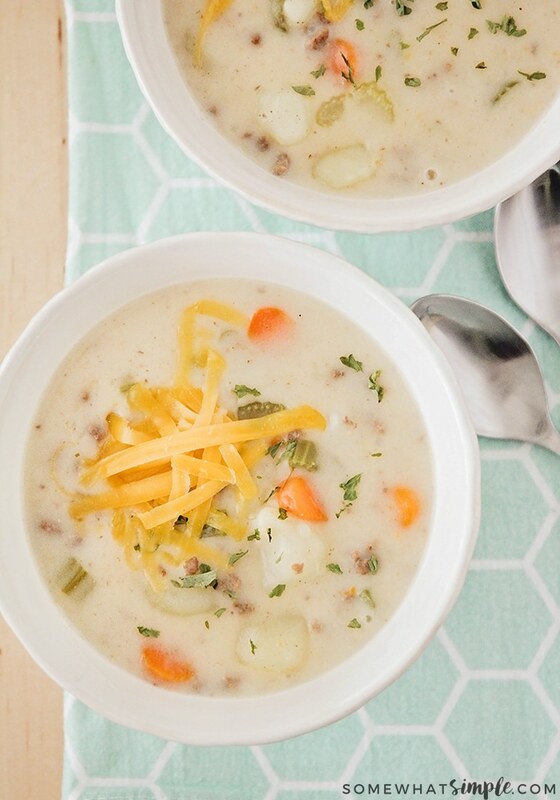 Crock Pot cheeseburger soup is full of the same savory flavors of a juicy cheeseburger but in a delicious soup. 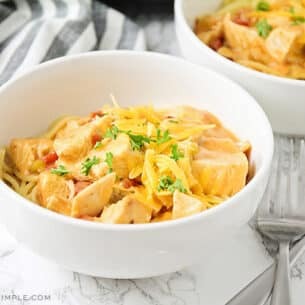 This recipe can be made using either a crock pot or an instant pot so it’s the perfect make-ahead dinner for a busy night! The days are getting cooler, and it’s time to savor those fall soups! Soup, as a category, is probably my favorite food. I love that there are so many different varieties! It’s basically impossible to be bored with soup. I eat soup all year round, but during the colder months, I plan on soup for dinner at least twice a week. It’s the perfect way to warm everyone up when it’s cold out, and it’s great for our budget, too. Most soup recipes make at least two dinners’ worth for my little family, and it’s so helpful to be able to put the extra soup in the freezer for another day. 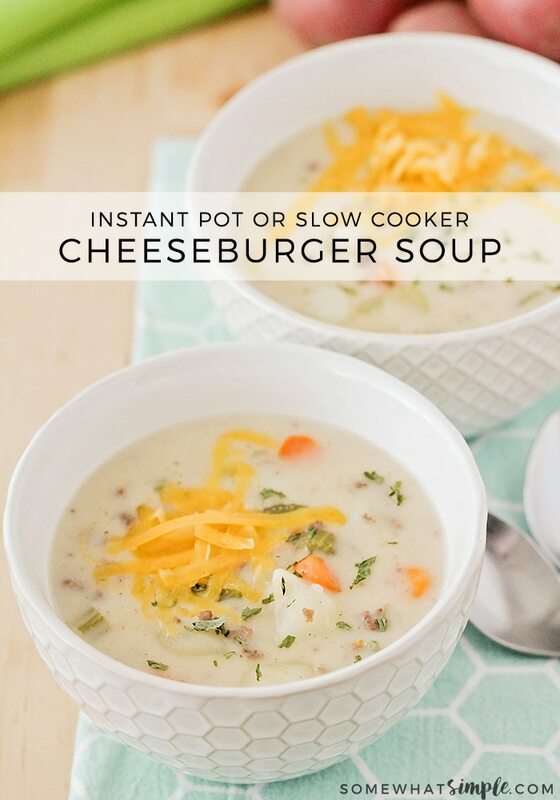 This crock pot cheeseburger soup is a favorite at my house! Filled with potatoes and vegetables, it’s hearty and filling, but simple enough that even picky eaters like it. Both of my kids love it and will eat it without any complaints. Score one for mom! 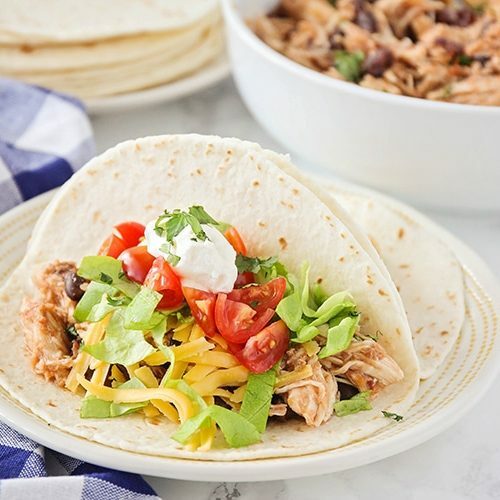 This easy recipe can be made using either a crock pot or an instant pot. I have included directions for both ways below so you can make them using your preferred method. Crock Pot cheeseburger soup is full of the same savory flavors of a juicy cheeseburger but in a delicious soup. 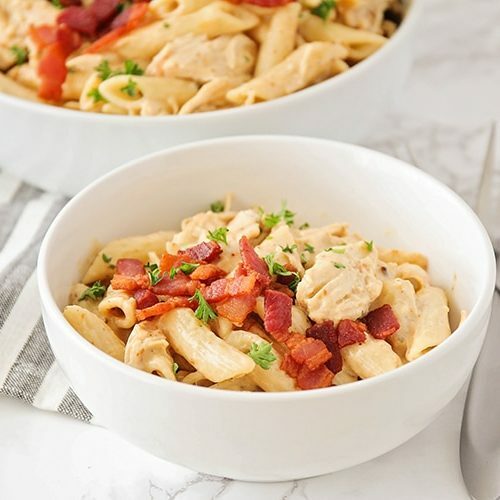 It is the perfect make-ahead dinner for a busy night! Add the ground beef, potatoes, celery, carrots, and chicken broth to the Instant Pot. Cover, turn the knob to seal, and cook on high pressure for 15 minutes. Let the pressure release for ten minutes, then quick release. While the pressure is releasing, melt the butter in a medium saucepan over medium heat. Stir in the flour. Cook 3-4 minutes, or until golden brown. Slowly stir in the milk, a little at a time, while whisking constantly. Cook 3-4 minutes, or until thickened. Remove from heat, then stir in the salt, pepper, garlic powder, and cheddar cheese. Pour the cheese sauce mixture into the Instant Pot and stir to combine. Cover and cook using the slow cooker function for an additional 15-20 minutes. Add the ground beef, potatoes, celery, carrots, and chicken broth to the slow cooker. Cover and cook on low for 6-8 hours. During the last ten minutes of cooking time, melt the butter in a medium saucepan over medium heat. Stir in the flour. Cook 3-4 minutes, or until golden brown. Slowly stir in the milk, a little at a time, while whisking constantly. Cook 3-4 minutes, or until thickened. Remove from heat, then stir in the salt, pepper, garlic powder, and cheddar cheese. Pour the cheese sauce mixture into the slow cooker and stir to combine. Cover and cook an additional 20 minutes. We have a large family so I used an 8 quart Crock Pot when making this soup. Any slow cooker works great but I have had a Crock Pot brand for years and absolutely love it! Last year I bought my first pressure cooker and it has been amazing! I love and use an Instant Pot brand pressure cooker but any brand should do a great job. 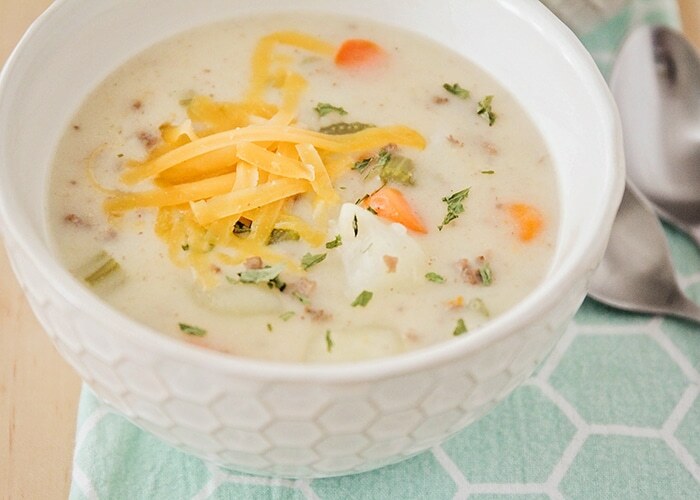 The combination of flavors in this soup is fantastic! Here are a couple of tips to consider when making this soup that will bring out the best flavor. If you’re going to add bacon to your soup, don’t add in raw bacon at the beginning. Cook it separately and then add it in to the soup about 15 minutes before you serve it for the best flavor. Feel free to add any other vegetables you like as well. 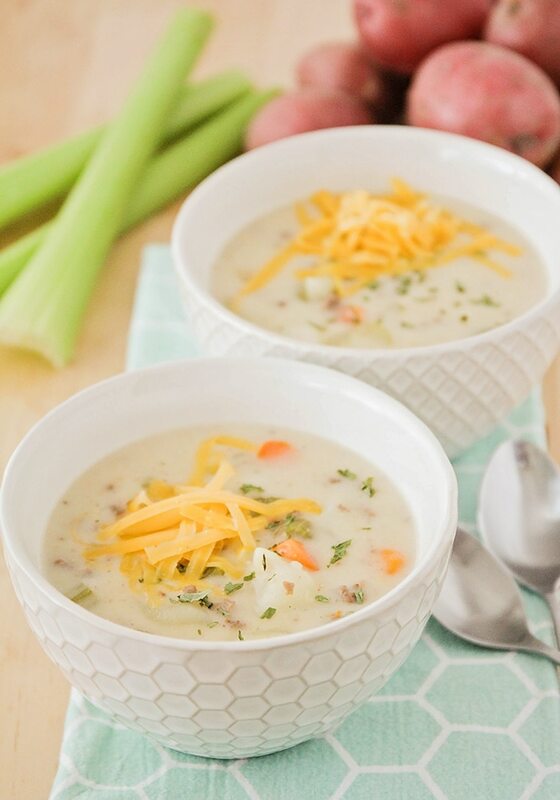 This soup is sure to be a crowd-pleaser! 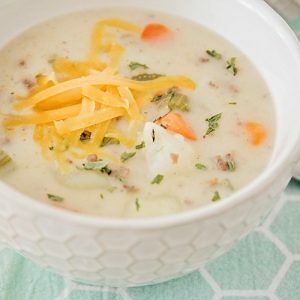 What Are Other Easy Soup Recipes?